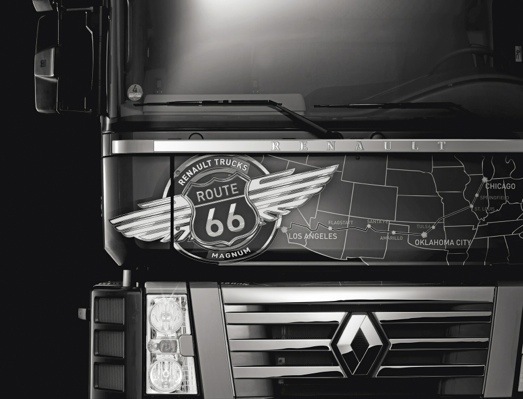 With its “Route 66” operation in Spring 2009, Renault Trucks combined two legends: the brand flagship “King of the Road” Renault Magnum and the famous Route 66 which crosses the United States from Chicago to Los Angeles. 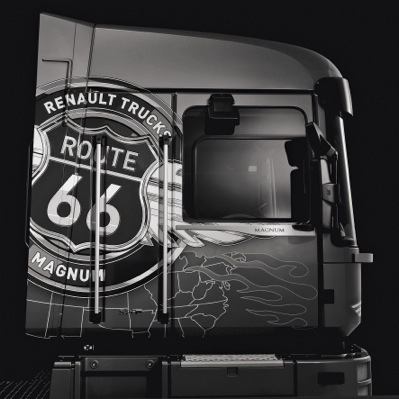 In the autumn of the same year, at Le Mans, Renault Trucks presented a Magnum decked out in the colours of Route 66 during the 24 hour Truck Race. 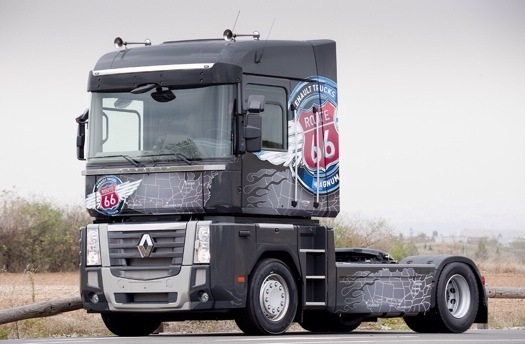 As a result of the public’s enthusiasm and the interest generated by this vehicle, Renault Trucks decided to launch in France a Magnum “Route 66” limited edition with specific exterior decoration, exclusive upholstery and superior equipment. 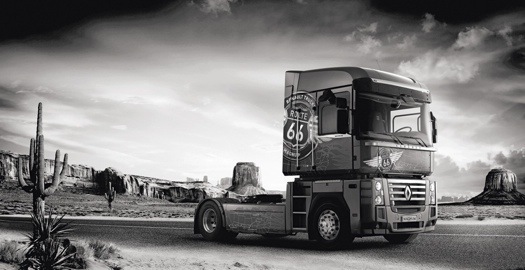 A Magnum designed to blend the excellence of Renault Trucks with the American dream. winged Route 66 logo on the doors, the specific “Diamond Brite” aluminium rims, chrome plated radiator and air tank, and much more. Everything in fact, to ensure that this Magnum attracts even more attention than usual on our roads! 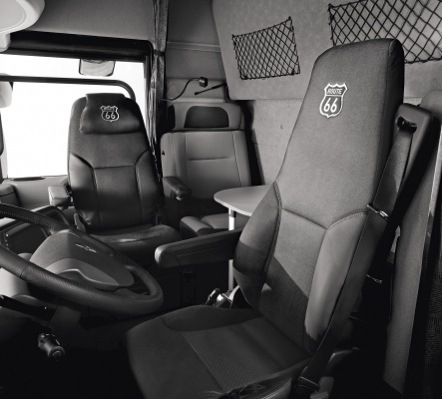 The dream goes on inside the cab, with its exclusive anthracite grey upholstery fabric and a red Route 66 logo echoing the exterior decoration. In terms of equipment, the Magnum Route 66 is fitted with the very best available to make swallowing up the miles as pleasant as possible – even if they are French kilometres. This includes the Optidriver+ gearbox, the Excellence Pack with a CD MP3 Bluetooth radio, under-bunk refrigerator, Multipass cab and swivelling passenger seat. On the mechanical side, the Magnum Route 66 is available as a 4×2 tractor with a DXi 13 Euro 5 engine and three ratings for customers to choose from: 440 hp, 480 hp or 520 hp. specially selected for this amazing challenge. Furthermore, Renault Magnum has won great favour among long haul transporters for its onboard comfort and also its performance. It travels throughout Europe from north to south and has become the reference motorway vehicle, particularly in Spain, as well as playing a major role in the process of opening up Eastern European markets. And in the US, from the great industrial metropolises around the Great Lakes right through to the east coast via Las Vegas, Route 66 offered a real challenge to France’s “King of the road”. days were no more than a stroll in the park for a vehicle designed to supply the same performance with flawless reliability for more than 100,000 km a year. between Le Havre and Baltimore. This was all about the passion of transport, particularly for drivers. Sitting proud behind the wheel of a piece of machinery that weighs over 40 tons makes you one of a select band of truckers from a different world, with its own codes and a unifying passion for the road and trucks. Renault Trucks is there to help its drivers on the road through its repair garage network and its assistance vehicles which come to drivers’ aid 24 hours a day, as well as during Grand Prix truck racing events and through a customer relations programme based on the Truckdriver’mag magazine and website. It was in fact Truckdriver’mag that organised a draw to choose the two winners for this operation during the 24-hour Le Mans truck race in 2008: Eric Mortiz and Jean-Patrice Bullot. Throughout this unique adventure, they were assisted by the brand’s demonstrators in France, driving experts who help customers every day to get the most out of their vehicles. Aboard these 3 Magnums which crossed the 8 States of Route 66, drivers, customers and employees, all passionate about trucks and about the Magnum, lived the most memorable journey of their lives together. Beside them, an entire company, plus its distributors and repairers, followed this unprecedented adventure with emotion and pride. Through them, the whole of the French transport world rejoiced to see the French flag flying for a while in the land of Uncle Sam – in contrast with the heckling it sometimes gets at home. It was a moment of grace for Renault Trucks and the French haulage industry in general, proving to the rest of the world that it and its hauliers see a long way beyond difficulties and national frontiers. This entry was posted in Guest Writers, International Mega Trucking, Renault by truckbloguk. Bookmark the permalink.